Batman and Robin fight Killer Croc near a museum, as Croc resists returning to prison. After causing tremendous property damage, Croc slips away down the sewer tunnels. Batman advises Robin to wait and be ready when Croc inevitably emerges. After the fight, Summer Gleeson prepares her report. Her boyfriend, Steve Nemeth, disagrees with her negative take on the involvement of the dynamic duo. She explains that the caped crusaders are down in the polls, so she’ll react accordingly and slam them in her report. In doing so, she humanizes and shows sympathy for Killer Croc. Croc sees the televised report, and is mesmerized by her unusually kind words. Later, when Summer and Steve arrive at her apartment, Killer Croc is waiting for them. Steve puts himself between Summer and Croc, and is hurt for his efforts. Croc says he only wants to talk, and tries to find common ground over Van Gogh paintings. Before he leaves, he promises romance. Later, outside the hospital where Steve has been admitted, Batman and Robin ask Summer what happened. They deduce from the conversation with Croc that he’ll strike again at another museum. They find Croc tearing the place apart, looking for paintings by Van Gogh. They take the fight outside, wear Summer is recording the fight on video. When she witnesses the violence close up, she tells Croc to “Stop, you animal!” And just like that, the fight is over. Croc realizes Summer is no different than anyone else, and he sits and prepares to be returned to prison. This story is a fair attempt to humanize Killer Croc, and I give Templeton credit for that. It’s a complex issue to boil down to 22 pages in a kid-oriented comic. But I think the effort worked, under the circumstances. Bo Hampton steps in on pencils. His art is adequate to the task, but a little soft on the Timm stylings. There’s nothing particularly wrong with the art, it’s just a little generic. Of interest to me is the coloring of Croc. 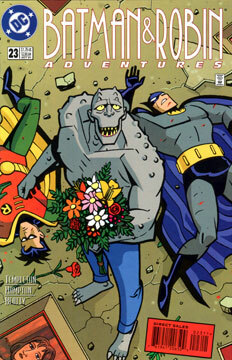 This issue was released just months before the New Batman Adventures hit the air. That means the comic creators might have been aware of some of the upcoming style changes. In this issue, Croc’s coloring is a little closer to his TNBA colors rather than his BTAS colors. (The same can be said of Mad Hatter in issue #17.) I wonder if these were conscious choices?